COLUMNIST, journalist, scholar, historian, diplomat and lawyer—Khushwant Singh wears many hats, even as he seldom sports the turban these days. But then, at 97, he can pretty much do what he wants to now, which is what he has done most of his life. Lakhs of readers in India meet Khushwant Singh through his columns translated into many languages and published across the country. His books have contributed substantially to Indian literature and the study of Sikhism. He has raised controversies, lived life to the fullest, and now is one of the rare individuals having a literary event named after him— the Khushwant Singh Literary Festival — which gets off to a start today at his favourite hill station, Kasauli. Khushwant Singh was one of the earliest students of Modern School, Delhi, after which he attended St Stephen’s College, Delhi, where he was more devoted to tennis than academics. He did clear his Intermediate Arts exam and went to Government College, Lahore, to study law, a pursuit that took him to England, where he did his LLB at King’s College, London. London introduced him to different shades of romance. He met his wife-to-be there. Kaval Malik, daughter of Sir Teja Singh Malik, whom he remembered as a gawky schoolmate. By then she was a much-sought-after beauty. His earlier misadventures in the UK are faithfully documented in Truth, Love & A Little Malice, his autobiography, an engaging and candid account of his life. After he returned to India, Khushwant Singh tried to make a living as a pleader, without notable success. He, however, put his time in Lahore to good use by spending as much of it as he could with many creative people and literary luminaries in the cultural capital of North India. The Partition made him move from Lahore to Delhi, the city that his father, Sir Sobha Singh, helped to build as a contractor. He also moved away from law and focused his energy on writing. What he saw as he left Lahore became the subject of a story, Mano Majra, which won him a $1,000 prize from Grove Press. The story of Mano Majra village became the famous Train to Pakistan (first published in January 1956), and established him as a creative writer. Unlike many writers, Khushwant Singh scholarly work dominates the early period, when he translated parts of Sikh scriptural texts, worked for the Unesco and lived with his family, which now included his son Rahul and daughter Mala, in Paris. Two years later, he quit, without a job in hand. Earlier, he had served in Canada and the UK as an Indian diplomat, but left the service, much to his father’s disappointment. An editorship of Yojana, a government publication, came his way in 1957, but he did not find it fulfilling. 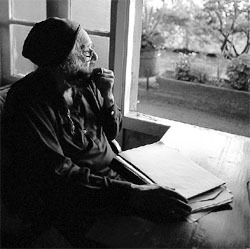 With the support of the Rockefeller Foundation, he wrote A History of the Sikhs, followed by a biography of Maharaja Ranjit Singh and a book on the Anglo-Sikh wars — all came out in the four years that Khushwant Singh spent on this project, during which period he also taught at the University of Rochester, Princeton University and University of Hawaii. Lucidity and research define these volumes, and both point towards the disciplined person that the writer is, contrary to a carefully cultivated image of a bohemian and an epicurean, a persona most people are familiar with, and indeed identify with, somewhat erroneously. He is known to drink only Scotch or single malt, and in case the host doesn’t have his brand, the grand old man will get one himself, and the guests are welcome to drink from it, as long as he is there with them. Dinner has to be served at the proper time (by 8 p.m.) and he retires early, even if the party is at his home and the guest is Rajiv Gandhi. Khushwant Singh is a disciplined person. He gets up and writes every morning, takes his deadlines seriously. He is knowledgeable about birds, trees, flowers and various aspects of nature. As his son Rahul Singh likes to point out, it was a case of father following the son into a profession. Rahul had been an Assistant Editor with The Times of India in Bombay for five years, when Khushwant Singh was offered the editorship of The Illustrated Weekly of India. Rahul left Bombay to become the first Indian editor of Reader’s Digest. Since Kaval did not want to move from Delhi, Khushwant Singh moved into the PG accommodation that Rahul had previously occupied in Bombay. The Illustrated Weekly of India soon became the most sought-after magazine. Its circulation grew from one lakh to over four lakh copies per week. Khushwant Singh mentored bright journalists who became successful editors later, including M J Akbar, Bachi Karkaria, Bikram Vohra, and even JIS (Jiggs) Kalra, the famous cook book writer and food critic. Khushwant Singh was at the top of the world, till it all came crashing down with his abrupt removal, evidently at political behest. The writer returned to Delhi where later he was to edit The National Herald and eventually The Hindustan Times, where he had a three-year stint. Khushwant Singh and controversies often went hand in hand. Be it the salacious details of gossip that make way into his columns and writing, his fondness for Scotch and girls who gossip, he is a man of contrasts and has unfailingly waged a war against priggish mindsets. He liked Indira Gandhi but opposed the Emergency. He was fond of Sanjay Gandhi and his wife Maneka, and paid the price for it when Indira Gandhi turned against Maneka, and Khushwant Singh refused to do so. On the other hand, it was Maneka Gandhi’s petition to the Supreme Court that held up the publication of the author’s autobiography for five years! He was among the few who stood up to Sant Jarnail Singh Bhindranwale and the extremists, and wrote fearlessly against them. This earned him a place on the hit list of the militants who called him a Congress stooge. It was with that party’s support that he became a member of Rajya Sabha from 1980-1986. His returning the Padma Bhushan, awarded to him 10 years earlier, to protest against Operation Bluestar earned him the wrath of Congress leaders and many others. He is an ardent admirer of Mahatma Gandhi and Mother Teresa, but the admiration comes with reservations. His admirers come from all sections of society, and include some of the most prominent people, Indians and foreigners alike. Tens of lakhs of readers in India read Khushwant Singh’s columns. This Above All is published weekly in The Tribune and in many other newspapers in many languages. With Malice Towards One and All, is published in the Hindustan Times. He has a unique ability to reach out to ordinary readers, inform and entertain them on contemporary issues. He gets a laugh, generates controversies, and comments daringly on issues. He engages his readers and they have made him India’s most read columnist ever. He is generous in endorsing writers and in writing about their books in his columns. Many readers write to him, and most are pleasantly surprised to get back a handwritten postcard reply from him. “I have always tried to reply to every letter that I get,” he says. He played tennis at Delhi Gymkhana Club, as did his wife Kaval. Widely regarded as an independent person with strong likes and dislikes, she was the strength behind the success of the family to which she devoted her life. Kaval passed away in 2002, after battling Alzheimer’s disease. The devotion with which her family—Mala, now an author and an editor, Rahul and Khushwant Singh—looked after her in those years is still talked about by those who know the family closely. Everyone one meets has a Khushwant Singh story to tell, either something that has been read, or an interaction that became a memorable moment, or some inspiration that changed the direction of a person’s life. Such is the man who has lived life on his own terms and has never allowed the inkwell of his creativity to run dry.